Introduce your child to one of the world's most widely spoken languages with our Introduction to Hindi Vowels and ConsonantsSeries. In this worksheet, we'll be learning to write and pronounce vowels u and oo. In this worksheet, we'll be learning to write and pronounce vowels i and ee. All vowels behave differently. Explore the difference between the two "oo" sounds with this phonics worksheet. Can you tell which words have a long "U" sound? Here's a helpful clue: the long "U" vowels make the sound of the letter "U"! It takes a long "U" sound to make "music"! 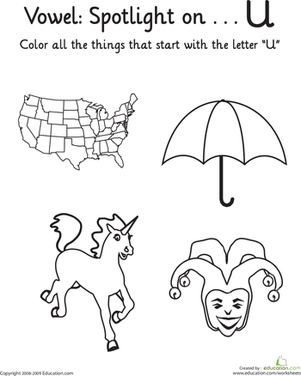 On this worksheet, learn to distinguish long and short "U" sounds.